I am very grateful for your kind support and would like to share my expedition experience with you. Let me first say, this expedition exceeded all my expectations. 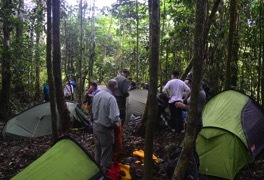 The expedition to the High Andes and the Amazon is by far the biggest challenge I have undertaken to date. 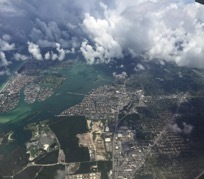 Following on the heels of the 2016 ‘Moonlands’ expedition – also kindly supported by your organisation – we departed the UK for Miami in the early hours of July 12, 2017. 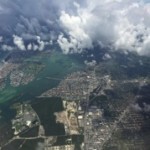 The flight to Miami was long, but went without a hitch. We were not so lucky with the connecting flight. A large storm grounded us for several hours; changing our plans and reminding us how little control we have over the natural world. After landing at Quito, we made our way to a town called Carcelen. Our accommodation was an old scout hut. We slept in bunk beds and lived in a communal setting. Now I think about it, some of my best memories of the expedition are those of the expedition group sat around the fire; singing, eating and laughing. On our second day, we ventured into the city. One of the first things that hit me was the large amount traffic. 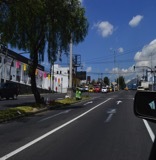 For the most part, the roads were noisy and polluted. City dwellers largely ignored the traffic lights as they jostled for position on route to their destinations; vehicles spewing thick toxic fumes into the air. I immediately got the feeling that the roads were a dangerous place to be. Ecuador is trying to address some of the more serious problems by hanging blue love hearts on the roadside; each heart signifying a life lost and reminding drivers that they are travelling a particularly dangerous road. In some areas the blue hearts numbered in the hundreds. Unfortunately, Ecuador’s small police force and limited judicial resources mean that traffic violations oftentimes go unnoticed and unpunished. 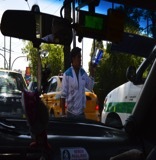 In addition to traffic problems, OASC reports ‘Pickpockets are petty thieves are particularly active in tourist areas, airports, restaurants, on public transportation, crowded streets, bus terminals, public markets, and grocery stores.’ Backpackers and tourists are frequently targeted. That was a little scary. 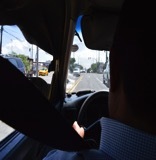 We would have to keep our wits about us as we travelled through the city! Fortunately, our expedition went without incident. For the most part we were made to feel very welcome. The only exception was the marketplace, where I felt that some of the traders were a little too enthusiastic about getting us to buy their goods. A fake Rolex is thrust into my hand and payment requested. A shove and I drop the watch. Now I have to pay for it! It’s sad really, to see how desperate some peoples’ lives are. Honestly, I had expected to see more poverty than we did. 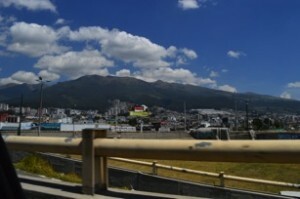 Ecuador is developing quickly and the country’s population is still rising rapidly. 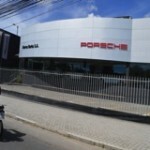 This is most evident in the north where we saw a Porsche dealership. 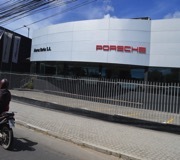 Who’d have thought they would be driving Porsches here! The Ecuadorian government is creating its own version of a NHS and is working to bring the country out of poverty. From what I witnessed, this is yet to extend into the towns. 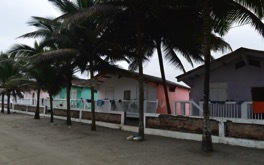 These remain largely under-developed and lack basic public services, sanitation and good medical facilities. Yes, the country is evolving. But it’s evolving slowly. The program for the first two weeks was bike, trek and rest. 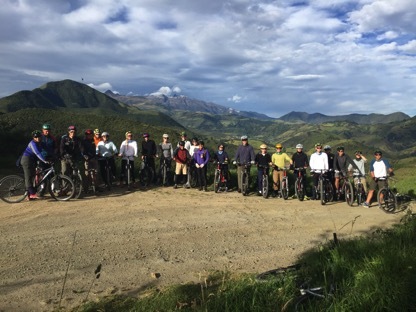 We cycled some of the best trails, Octavalo, Tandayapa and Perucho. 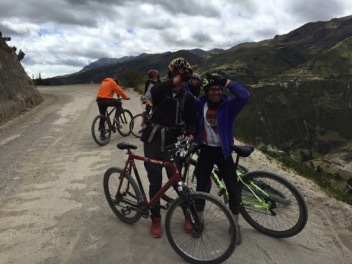 Our highest and longest bike ride took us through Quilotoa. 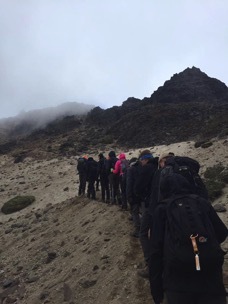 We climbed four volcanoes, Pasochoa, Rucu Pichincha, Corazon and Illiniza. The climbs got gradually harder as the days progressed. For me, the best was Illiniza. The Illinizas are 2 volcanic mountains located to the south of Quito, in the Illinizas Ecological Reserve (Reserva Ecológica Los Illinizas). 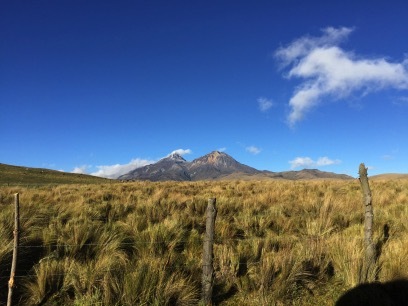 These peaks are separated by a kilometre-long saddle and are among the highest in Ecuador. Illiniza Sur stands slightly taller than its northern counterpart Illiniza Norte, 5,248 metres and 5,126 metres. We climbed the south peak. The north peak is incredibly technical and thus was too dangerous for us to attempt. The beginning of the climb was great and we hiked in a tight group. But as we ascended, the group thinned as the effects of altitude sickness started to take hold. We aimed to make the summit, but the weather closed and we were forced to abandon the ascent. 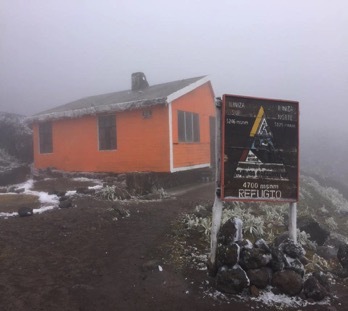 With visibility at less than 5ft, we took refuge at 4,600m. It’s scary how quickly the weather can change on the mountainside. What started as an enjoyable hike, quickly became quite dangerous. 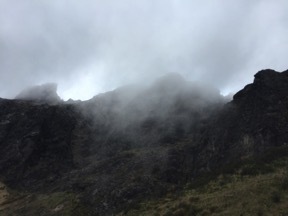 We did, however, manage to reach the summits of Pasochoa and Rucu Pichincha at 4800 metres. 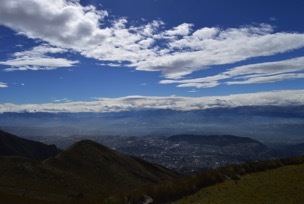 We stood above the capital city Quito and took in the view. Way down there in the city people looked like ants. Pichincha is an active volcano. The peaks of the mountain are Wawa Pichincha (child, baby / small) (4,784 metres) and Rucu Pichincha (old person) (4,698 metres). The caldera is in Wawa Pichincha on the western side of the mountain, but Rucu is the volcano that regularly impacts Quito; it regularly showers the city in ash and erupts every 4 to 5 years; sometimes sending lava and magma into the city. 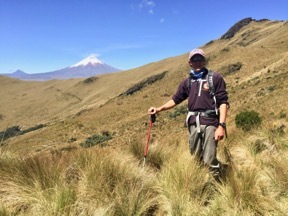 There are over 600 of these volcanoes across the Andes range and I remained intensely aware of the explosive power below my feet for the duration of the expedition. The cycling was great. Starting at a moderate difficulty and gradually getting harder. We cycled to Quilotoa, a water-filled caldera and the furthest west volcano in the Ecuadorian Andes. The 3km wide caldera was formed following a massive eruption some 800 years ago, producing pyroclastic flows that reached as far as the Pacific Ocean, and airborne deposits of volcanic ash throughout the Northern Andes. On the final day of cycling we biked over 80 miles, negotiating some extremely bumpy ground at altitudes of 4,000m. 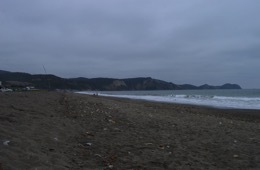 At this altitude, the cycling became very difficult. The mountain biking for me was the best. Zipping through the mountains was a great feeling; like flying! Making it to the summit was really satisfying. 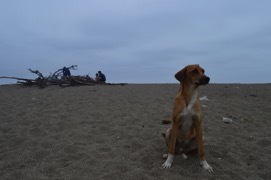 Along the way we had passed through towns and villages, the homes of bears and bats, and taken in the beautiful canyon scenery; we had even made some Ecuadorian friends. In the 4 days we had cycled over 200 miles. This would not have been possible without our most excellent guides, Rafael Martinez and Jorge Tello. These two dedicated guides and their team, kept us going when the going got tough. Living in the extreme conditions of the High Andes has made them hugely-fit and strong-willed. I couldn’t help but admire their tenacity. They were literally unstoppable. Their energy is infectious. 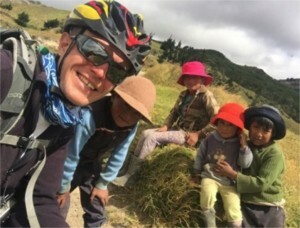 The DES expedition to the Andes has been running for 30 years and Rafael has been the lead mountain and biking guide for 25 of those. There has never been a fatality or accident on the mountain on his watch. He is acknowledged to be the finest guide in all of Ecuador and his list of climbs is impressive. He has summited many of the world’s highest mountains, including, Everest (3 times). He is renown for his rescue of a climber on Cotopaxi who had fallen into a crevasse. In white out conditions, in a blizzard, he located and saved the life of the person who became a close friend thereafter. This is testament to his ability, knowledge and professionalism. I can’t thank these wonderful people enough. 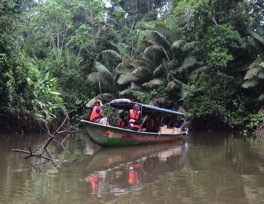 Next, we set off for the Amazon rainforest. I have seen so many documentaries, movies and articles that feature this magnificent rainforest, but I never thought that I would be going there. The Amazon for me was both beautiful and horrid. The scenery is magnificent, but the heat is intense 24 hours a day. You sweat when you walk and you sweat while you rest. 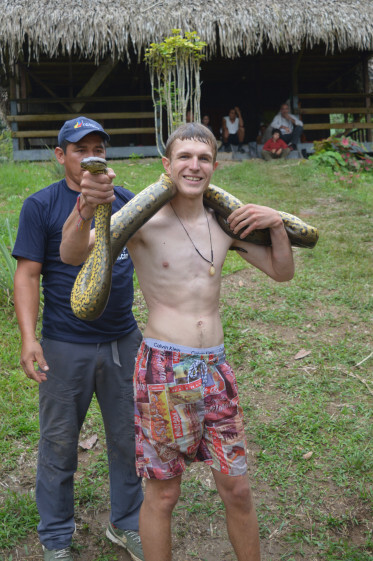 Sleep does not come easily in the Amazon. We spent some time swimming in a wonderful lagoon. The water was cool and a welcome relief from the heat. So much so that I completely forgot about its predatory inhabitants for a while. 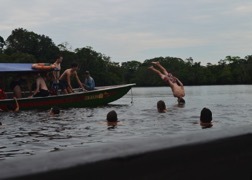 What made it so special was the knowledge that we were swimming in the Amazon river. How many people get to do that? 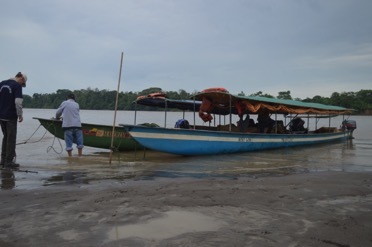 After our time in the Amazon we made the ten-hour-long bus journey across the Andes, through 3 climatic zones, in the direction of the coast. It was hot, then cold and foggy as we entered the clouds. At the coast the group relaxed and settled into the new surroundings. We explored the town of Puerto Cayo, swam in the sea, relaxed in beach huts but we were still working hard at the same time. 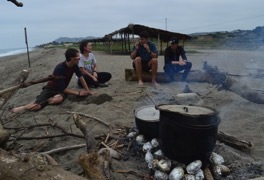 Each group was responsible to go into the neighbouring town to buy fish and then cook over an open fire. Responsibility was a key word for us all. Every one of us who applied and selected had to take on some aspect of leadership during the trip. My role was accommodation: this was a high- pressure job. Having to negotiate with Spanish hotel receptionists and ensure everyone had a bed to sleep in proved demanding. I had to use my own initiative and think quickly on my feet to avoid mistakes in a language I was less than good at ! Being put under pressure certainly helped me to become much more self-confident. 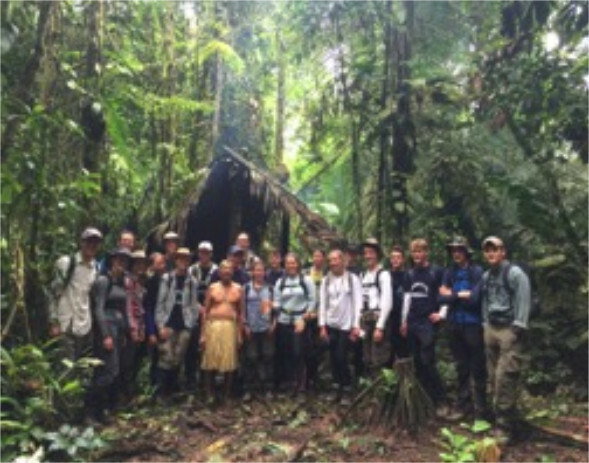 This was a fantastic end the expedition and an opportunity for us to recount our experiences. Thanks to the support of organisations such as yours, a wonderful group of people, and the leadership and motivation of our dedicated guides and expedition staff, we achieved the incredible. We remained confident and strong, made good on our promise to finish the expedition and we gladly pass the baton of exploration to those that follow. One day I hope to return, but now I want to focus on my next expedition… Mont Blanc. Thank you for helping make this dream possible.